When the days get short and the weather turns cold and wet, there is nothing like a good bowl of soup. These are some of my favorite meal-in-a-bowl soup recipes, packed with spice and flavor. These vegan recipes rely on winter vegetables as well as pantry staples to warm you inside and out. The Potato Goulash is a take on the goulash my Italian-Hungarian step-grandmother made. It is more of a soup than a stew, but you could ladle it over noodles if you like. Try serving it with a dollop of regular or non-dairy sour cream on top. 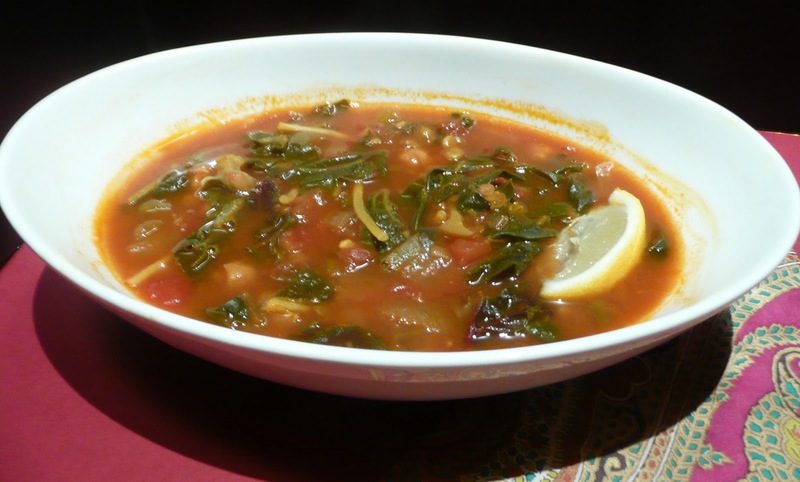 The Harira with Greens is an interpretation of a hearty soup eaten throughout Morocco. The exotic scent and deep flavor make it like a spice market in a bowl. My twist on a traditional East European sweet and sour cabbage soup includes balsamic vinegar and butternut squash. Serve it with some crusty wheat, rye or black bread. Heat oil in deep pot or sauté pan. Sauté onion until light brown, add garlic and sauté until golden. Add pepper strips and sauté until beginning to soften. Add caraway and paprika and stir well. Add tomatoes with liquid, broth, salt, black pepper and tomato paste. Stir. Bring to a simmer. Add potato cubes, return to a simmer. Lower heat and cook covered at a simmer until the potatoes are cooked through, about 15 minutes. Taste. Add more salt if needed. Heat the oil in a deep pot. Sauté onion for a few minutes until softened, add garlic and sauté until light brown. Add jalapeno and celery and sauté for another few minutes. Add ginger, cinnamon, turmeric, cumin, paprika, cardamom, pepper and salt and mix well. Add tomatoes with their liquid, tomato paste and water. Stir well. Bring to a simmer. Add chickpeas and lentils. Cover pot, lower heat to keep at a simmer and cook for about 20 minutes until lentils are almost done. Add chard and simmer 5 minutes. Add pasta and cook 8-12 minutes until pasta is cooked. Garnish with cilantro. Serve with lemon wedges to squeeze over soup. Pass hot sauce if desired. In a large pot, heat oil over medium high heat. Add onion and sauté until beginning to soften, add garlic and sauté until just golden. Add celery, carrots and squash and sauté for 3 minutes. Add red pepper flakes, oregano, thyme and black pepper. Stir well. Add broth and bay leaf. Bring to a simmer; add cabbage, tomatoes (with liquid) and tomato paste. Stir well cover pot and simmer until cabbage has begun to soften. Add water until soup is at desired thickness. Simmer until vegetables are softened. Taste soup and add salt as needed. Add balsamic vinegar and sugar. Mix thoroughly, let simmer a minute or two and taste. Add more sugar or vinegar as needed. Remove bay leaf before serving. A version of this post first appeared in the j. weekly. You can read the original article here. That cabbage one sounds right up my family's taste buds! As an aside, BlogHer is hosting a soup recipe thing right now, so you should check that out! Tried her Harira - it was good - and warming on a cold night! I like the mix of spices. Usually I have to use broth or cubes, but this recipe holds its own. I will try the cabbage soup next week, probably. Might not try the potato, because I have a problem with green peppers, and that seems to be an important flavor in that soup. Got a nice msg recently from ClaudiaH who tried out the cabbage soup on guests. Thanks, Claudia!